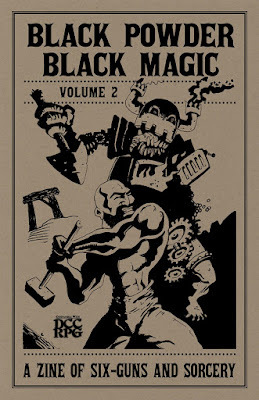 Black Power, Black Magic Volume 2 (by Eric Hoffman and Carl Bussler for Stormlord Publishing), takes over right where the first volume leaves off. You have 1st level characters and now you need to do something with them. First off, there is an article on Armor and Armor Class in the Weird West of Brimstone and the Dark Territories. Characters in Westerns seldom wear armor, and the good people at Stormlord Publishing have taken this into account. An article modifies each of the core human classes to fit into the setting. It also introduces the Gambler and the Prospector as new character classes. One interesting thing to note is that Cleric options include Catholic Priests and Protestant Preachers, as well as Native Shamans, bringing the option of using real spiritual beliefs into the game. This may delight you or not, depending upon how you view these sorts of things. Each has a separate list of Unholy Creatures. John Henry is fully described as a patron, and is completely appropriate to the setting. Finally, the Mine Wight is described in a new column, Varmints!, which describes creatures of the Dark Territories. This column includes an adventure hook that could be used to give your newly leveled PCs a quick adventure near Brimstone. Overall, the second installment of Black Powder, Black Magic gives you exactly what you need to continue your PCs from the first volume.